Shigeki Tanaka is the son of master blade maker Kazuyuki Tanaka. Following the passing of his father, Shigeki took over the reins of the business and began forging a name for himself while continuing to further enhance the stature of the family business. 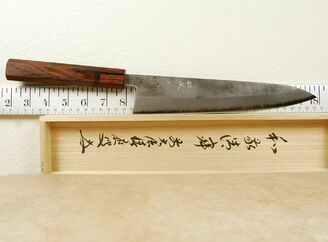 He works with a small crew of artisans in a small workshop in Miki City, one of the epicenters of blade making in Japan. Tanaka-san continues to employ the traditional methods to make all of his knives. 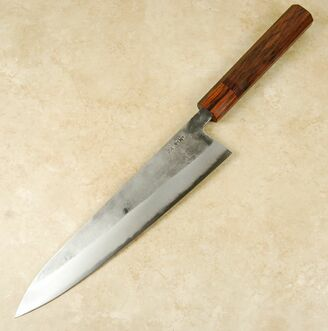 This gyuto a great example of his skills with Blue #2 steel. 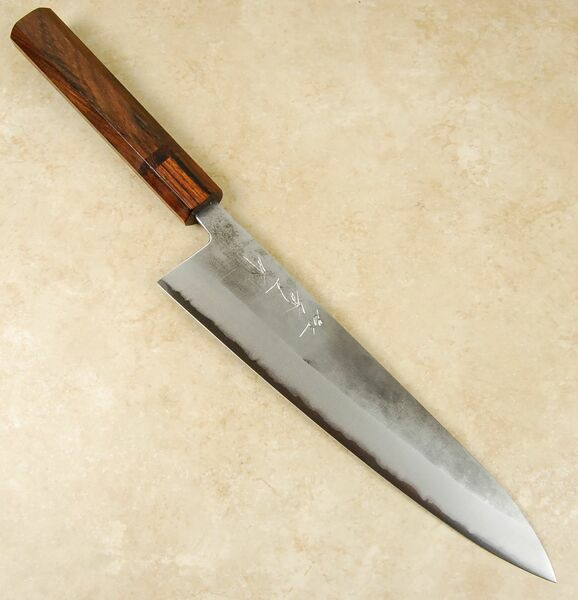 Blue Paper #2 carbon steel is one of the most popular steels for the making of kitchen cutlery. Tanaka-san hardens it to 62 HRC and clads it with a softer stainless steel to add strength and resilience. The cladding is treated with a nashiji (pear skin) finish. These are medium weight knives that have a stiff and controlled feel. The blade is well proportioned with an overall cutting edge length of 244mm coupled to a 51mm blade height at the heel. 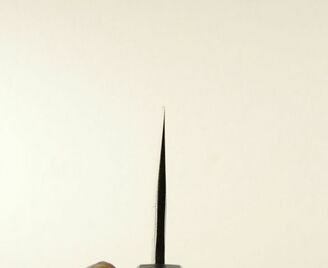 The spine is quite thick above the heel but tapers to a very nicely realized thin tip.